Take a Look at the Ford Fiesta ST's Performance Features | Milnes Ford Inc.
Ford's Fiesta ST is a popular performance hatchback with a lot of sleek styling features. One of its features is the aggressively styled back molding. This molding is extended, giving the car an aesthetic of a race car. 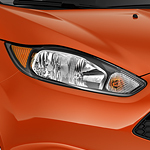 To keep you safe while driving, the Ford Fiesta ST has proprietary technology called AdvanceTrac. This technology constantly monitors the wheels and road for slipping. If a wheel slip is detected, it automatically makes adjustments in order to prevent the car from spinning out, skidding or losing control. Whether you live in a place with ice and snow or just occasional wet roads, this feature will keep you much safer. Do you want to see these features and more for yourself? Visit us at Milnes Ford Inc today, and we'll take you on a test drive.